"In a spirited match of illustration and text, Donohue offers a fresh story about friendship, advice, and sharing. The artist's crisp, animated paper-collage creations feature familiar animals in an unfamiliar setting: a kitchen where a rabbit cooks up recipes from her favorite Great Nana's cookbook. 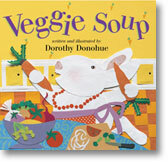 Things begin to go awry when friends invited to her veggie-soup party stop by to improve the recipe with favorite ingredients: worms, hay, fish, bugs. The result is a classic case of ‘Too many cooks spoil the broth.' The art dominates each double-page spread, with the oversized blue text printed in side panels. As the situation becomes more chaotic, the angles of the illustrations become wackier until the situation is resolved. . . . Families and classrooms could extend the experience by making their own soup following Great Nana's recipe included at the end."